The Garden Lodge Hotel Sydney provides budget tastefully furnished and well-equipped hotel accommodation centrally located just 7 kms from the Sydney Central Business District, the city's main commercial centre. 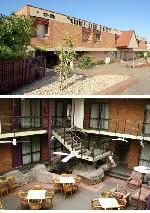 The Garden Lodge Hotel Sydney is walking distance to Summer Hill train station, bus-stops or travel by taxi. Close to Sydney tourist attractions including the Sydney Opera House, the Botanical Gardens, Chinese Garden of Friendship in Darling Harbour, the Sydney Aquarium, Oceanworld Manly, Taronga Zoo and Sydney Wildlife World, the Sydney Harbour Bridge and Sydney Harbour, you can understand why Garden Lodge Sydney is one of Sydney's most convenient and affordable comfortable accommodation. The Garden Lodge Sydney caters for business corporate travellers with FREE unlimited wireless high speed internet access in all guest accommodation rooms, faxing facilities and photocopying services. The Family Hotel Room is spacious, non smoking and comfortable, tastefully furnished and equipped with modern amenities, decor and furnishings. The fusion of warm pastel shades with wooden fittings creates the perfect sanctuary for a truly memorable stay. Ideal for a family, friends travelling together or corporate travellers, the room offers an open plan design with air conditioning and in room heating, 2 comfortable Queen Beds and 1 Single Bed, a private ensuite bathroom with shower, toilet, hair dryer and complimentary bathroom amenities, writing desk with lamp and chair, LCD TV, FREE Foxtel channels (including FOX Sports 1,2,3) DVD player upon request, FREE unlimited wireless high speed Internet access, dataport, direct dialling IDD phone, fridge, tea/coffee making facilities, in room safe ideal for a 14" laptop, alarm clock, iron/ironing equipment and a private balcony. The Queen + Single Hotel Room is spacious, non smoking and comfortable, tastefully furnished and equipped with modern amenities, decor and furnishings. The fusion of warm pastel shades with wooden fittings creates the perfect sanctuary for a truly memorable stay. Ideal for a small family, friends travelling together or corporate travellers, the room offers an open plan design with air conditioning and in room heating, 1 comfortable Queen Bed and 1 Single Bed, a private ensuite bathroom with shower, toilet, hair dryer and complimentary bathroom amenities, writing desk with lamp and chair, LCD TV, FREE Foxtel channels (including FOX Sports 1,2,3) DVD player upon request, FREE unlimited wireless high speed Internet access, dataport, direct dialling IDD phone, fridge, tea/coffee making facilities, in room safe ideal for a 14" laptop, alarm clock, iron/ironing equipment and a private balcony. Disability friendly apartments with walk in showers and handrails are available. If required please specify in the Special Requests Section of your Booking. The Queen Hotel Room is spacious, non smoking and comfortable, tastefully furnished and equipped with modern amenities, decor and furnishings. The fusion of warm pastel shades with wooden fittings creates the perfect sanctuary for a truly memorable stay. Ideal for a single, couple or corporate traveller, the room offers an open plan design with air conditioning and in room heating, 1 comfortable Queen Bed, a private ensuite bathroom with shower, toilet, hair dryer and complimentary bathroom amenities, writing desk with lamp and chair, LCD TV, FREE Foxtel channels (including FOX Sports 1,2,3) DVD player upon request, FREE unlimited wireless high speed Internet access, dataport, direct dialling IDD phone, fridge, tea/coffee making facilities, in room safe ideal for a 14" laptop, alarm clock, iron/ironing equipment and a private balcony. The Queen Spa Hotel Room iis spacious, non smoking and comfortable, tastefully furnished and equipped with modern amenities, decor and furnishings. The fusion of warm pastel shades with wooden fittings creates the perfect sanctuary for a truly memorable stay. Ideal for a single, couple or corporate traveller, the room offers an open plan design with air conditioning and in room heating, 1 comfortable Queen Bed, a private ensuite bathroom with LUXURY SPA BATH, shower, toilet, hair dryer and complimentary bathroom amenities, writing desk with lamp and chair, LCD TV, FREE Foxtel channels (including FOX Sports 1,2,3) DVD player upon request, FREE unlimited wireless high speed Internet access, dataport, direct dialling IDD phone, fridge, tea/coffee making facilities, in room safe ideal for a 14" laptop, alarm clock, iron/ironing equipment and a private balcony.